An epic historical adventure set in an alternate 8th century China, from the author of the 2008 World Fantasy winner, Ysabel. 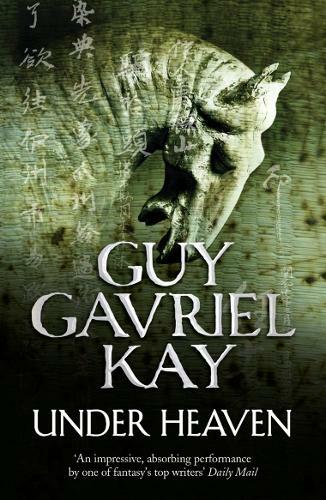 Under Heaven is a novel of heroes, assassins, concubines and emperors set against a majestic and unforgiving landscape. For two years Shen Tai has mourned his celebrated father and lived like a hermit beyond the borders of the Kitan Empire. There, by a mountain lake, the bones of the soldiers killed in great battles between the Kitai and the Tagurans lie unburied and their wailing ghosts strike terror into the living. Tai has laboured alone, laying to rest the mingled dead of both empires, until a letter arrives. It contains the promise of a poisoned chalice: Tai will be given two hundred and fifty Sardian horses by the Tagurans, legendary steeds from the far west, as a reward for his courage and piety. Now, Tai must try to return alive from solitude to a glittering, dangerous court. For to give a man even one of the famed Sardians is to honour him greatly; to give him so many is a reward which would overwhelm an emperor, and could be Tai's death warrant.